Our first mapping event is only a few days away, and we’re putting the finishing touches to some more guidance and support for our volunteer mappers. contributing to the map in your spare time. We’re expecting that the majority of people will be mapping using their mobile device. This is the simplest and quickest way to update the map with ratings, photos and notes. It would be helpful if you could install the app and sign-up to the service before the event. Just search the app store on your device for Wheelmap. We know that some people may prefer to capture information on paper and then upload it to the map later. So we have a paper form that you can fill in. We’ll have copies of this you can fill in on the day. It’s also useful for noting down details of any locations which might be missing and need to be added later. We’ll have people on hand to help get these ratings added to the online service. Add notes and comments to the place description on Wheelmap, e.g. about heavy doors, availability of a temporary ramp, etc. Wheelmap have a useful two page overview of how to rate different types of locations. It’s worth reading through this to familiarise yourself with the details. 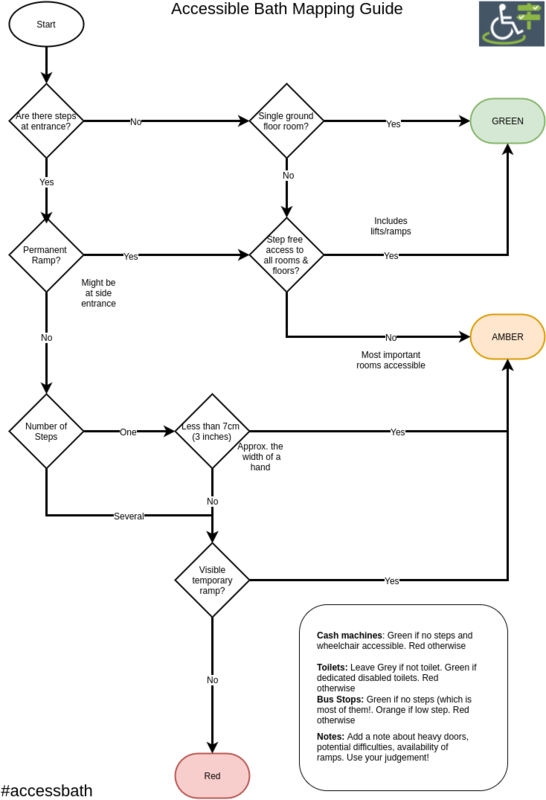 But to help you rate places as easily as possible we’ve summarised the guidance to create a simple flow chart for rating a location. This will help us consistently map shops and other locations around the city. The diagram has a few notes about how to map other locations such as cash machines, bus stops and toilets. The flow chart is intended as a guide and we encourage you to use your judgement. If in doubt, take a photo and add some notes to the location. This means that others can check your work. If you have other questions, have a read of our Getting Started guide. And we’re also always available on twitter and Slack if you want to ask us questions. 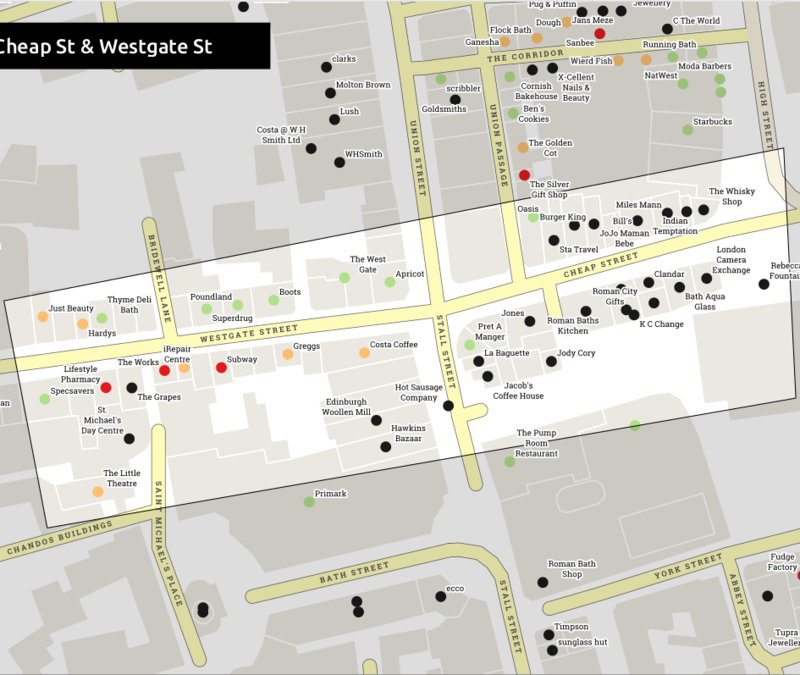 To help us co-ordinate on the day, we’ve created an atlas of key areas around the city centre. We’ll be dividing these up between our volunteers so we can cover as much of the centre as possible. Please also use the #accessbath hashtag to tell us if you’re out and about mapping! We’ll be posting updates from there on Saturday. There’s also still time to register for the event. And feel free to drop-in during the afternoon if you’d like a chat or to learn more about what we’re doing.